Several teachers at the West Bend High Schools are leading a new Wellness Wednesday program that allows students to sign up for sessions focused on relaxation, fun and the betterment of their mental health. Through the use of the online tool FlexiSched, students can opt to participate during their normal Wednesday resource time. Over the last two months, eight courses have been offered by teachers from both East and West High. The initial idea for Wellness Wednesday was brought forth by Kara Petzold, a West science teacher. “I thought it would be a great way to be able to take a break from our regular day and just relax,” Petzold said. Many of the teachers offering these courses have agreed that mental health can be an issue for students, and thought it would be beneficial to give students an opportunity to have a short escape from the anxiety and stress that can occur throughout the school day. 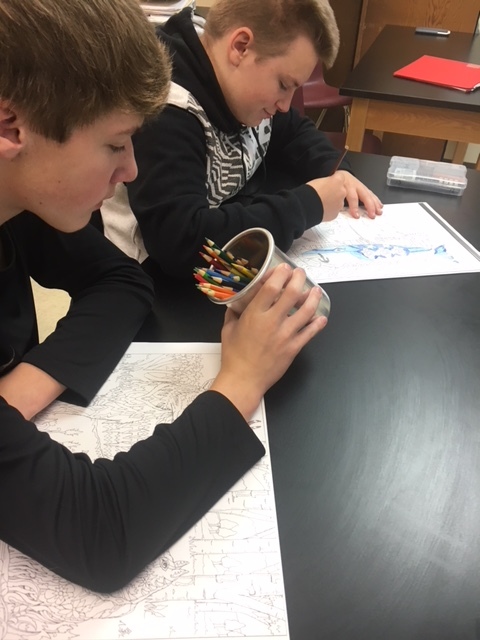 “I think some of my students have anxiety and a lot of homework, and this is just a way for them to disconnect for a little bit before they continue on with the rest of their day,” said Laurie McElligott, an East science teacher offering adult coloring. Students enjoy adult coloring in Laurie McElligott’s resource session. Photo courtesy of McElligott. 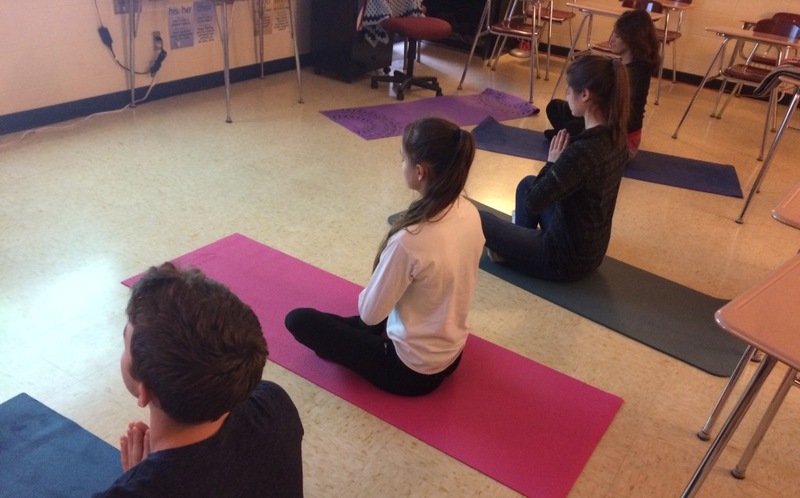 “A lot of students get stressed out and have no idea on what they could do to relax,” said Gail Rathsack, an East English teacher offering yoga. For the most part, the first two months of Wellness Wednesday have been seen as a success by teachers and students alike. The teachers leading the classes say they have found there has been much enthusiasm from students participating. “This session has been going great!,” said Jennifer Johannsen, an East assistant principal offering a course on mindfulness. “Those who are here are really enjoying it and are very interested in the topic,” Petzold said. East junior Jacob Schwechel says it’s been a good time. “It gives me that half hour in the school day to sit back, relax and let myself go,” Schwechel said. However, for many of the wellness classes offered, student attendance has been fairly low so far. As a result several of these teachers are working on developing and altering their programs in order to increase student interest and awareness of the opportunities. Petzold agrees that the program needs better promotion. As the year progresses, both students and teachers are hoping to develop Wellness Wednesday further and create new courses. “Maybe when it’s warmer there could be a class offering walking and getting outside,” East junior Sommer Schneider said. Petzold says that the sessions don’t have to be teacher-generated. She hopes that in the future students will sometimes take the lead. This is a fabulous idea! First I am hearing of the offerings, Love it.